Watching Curtis Eller perform is like watching your very own avatar play out your stream-of-consciousness; especially if you’re American, left-wing and you like to dance. 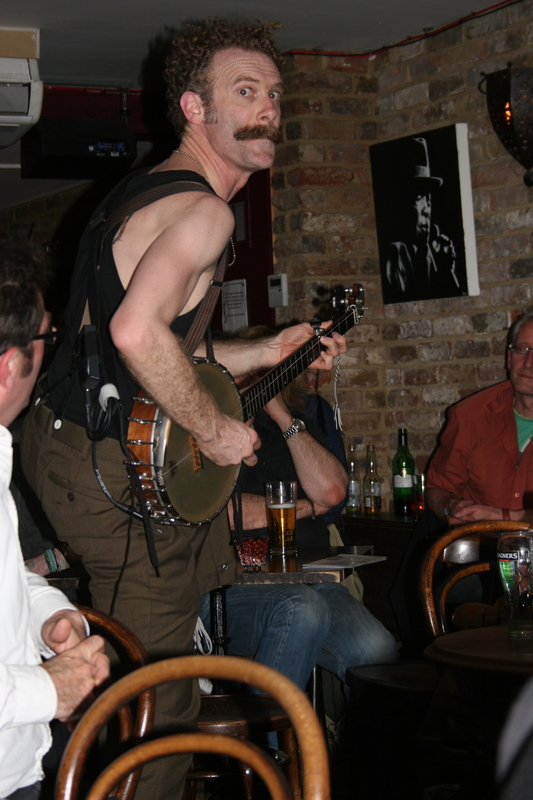 Touring across the UK for two weeks of down-home banjo playing with a strong mix of rockabilly, folk and bluegrass, Eller performed at The Green Note in Camden for the first time. The venue was small, but filled to the brim with Londonites looking for a good time. They couldn’t have guessed what they were going to get. Curtis’ sound has perceivable influences, the most obvious being Elvis Presley and the least obvious, old timer Dock Boggs. Yet, what results from his mixture of genre is something edgily original. His introduction to each song is part of his witty performance. His monotone northern American accent along with his tongue-in-cheek delivery has the audience chuckling madly. At one point, he jumps onto the empty chair of an audience member, who had left to go to the loo. A few well placed kicks in the air by Eller told the audience that this wasn’t going to be an ordinary gig. “If any musicians are interested, I’ve just knocked myself sharp,” Eller remarks to the crowd, as he re-tunes his banjo. Probably the most surprising aspect of Eller’s show is how similar he seems to people in his audience. He is the centre of attention in a British nightclub; yet the crowd wouldn’t be surprised if Eller suddenly sat down with them for dinner. His songs, with titles such as ‘Sugar in My Coffin’ and ‘Taking up Serpents Again’, have lyrics that are occasionally laced with strong political allusions. 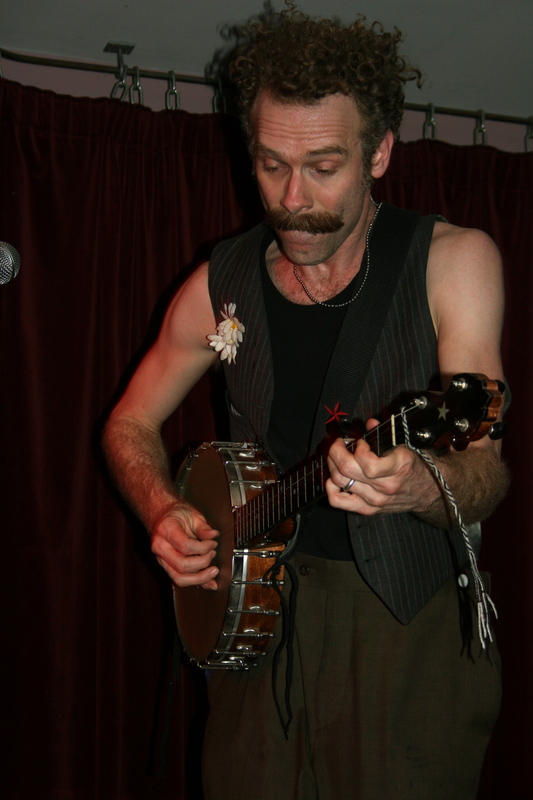 He is sometimes referred to as ‘the angry banjo player’. But that isn’t to say that Eller doesn’t have a soft side. He introduces one of his songs as being inspired by his three-year old daughter Daisy. The crowd collectively sighs, and Eller is off again spinning, jumping, kicking and booty shaking. 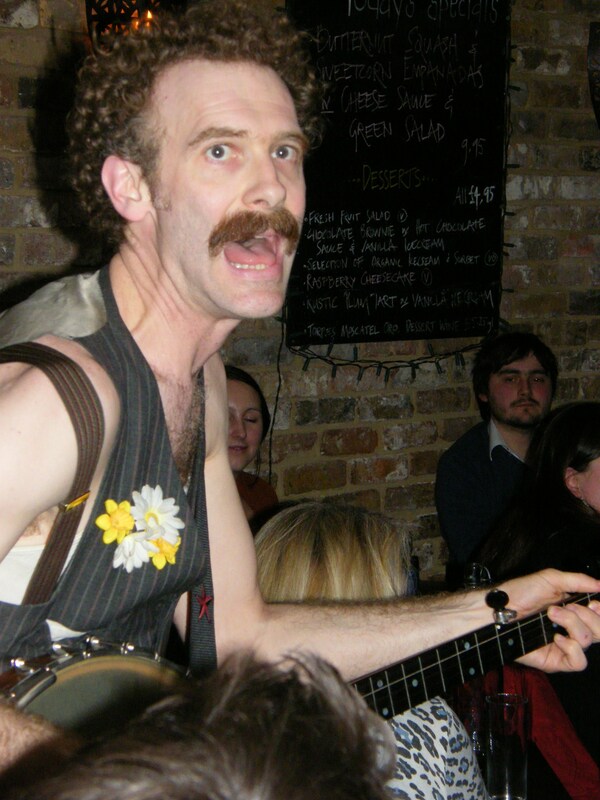 The sheer number of musical performances around London is countless, but true originality by singer/song writers is a difficult find; which makes Curtis Eller a refreshing change in the musical atmosphere. For more information about the artist and his music, click here.